The MULE continues its coverage of December’s Copenhagen Climate Change Summit (COP-15) with a dispatch from Manchester’s Sarah McCulloch, who acted as Medic for the Climate Camp group. Despite failure at the Summit to reach any meaningful agreement, there were positives to be drawn from Copehagen. The mass convergence of social movements from across the globe showed that there are people who won’t just wait for our leaders to hammer out ineffective solutions, but who are putting forward those solutions themselves and refusing to be silenced. I went with Climate Camp with the international network Climate Justice Action. Our plan was to use direct action to disrupt the COP-15: to invade the Bella Centre where talks were being held and to establish a “People’s Assembly” at the Reclaim Power demonstration on the 16th December. The aim was to show political and corporate elites that power is vested in the masses and that change cannot be dictated top-down. A variety of other demonstrations took place before Reclaim Power. These included “fluffy” (peaceful, non-confrontational) NGO marches, “spiky” (likely to face police antagonism and arrests) No Borders marches, and a harbour blockade. There were also various workshops for building activist skills. Organisation was on a decentralised autonomous basis, without parties or bodies telling protesters what to do but rather people coming together and making decisions. This maintains personal freedom and autonomy and, when you’re under threat of arrest and police raids, this built-in flexibility allows you to stay one step ahead. I acted as a medic during the week. I always had a role to play but also had responsibilities to others that prevented me from launching myself at a police line. I spent time standing outside our accommodation at 2am awaiting the return of drunk and/or tired activists to ask them to take out their outer layer of clothes amid sub zero temperatures to prevent them carrying tear-gas in and spreading contamination – not the most fun job but necessary, showing co-operation is possible between people organised on an autonomous basis. The medics had their own accommodation and phone-lines for people in need of first aid and for other medics to call if arrested and needing legal support. 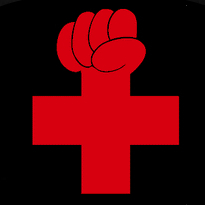 This came in useful when the Danish police began targeting and arresting medics early on: arriving at the space we were informed that 15 volunteers had already been arrested for giving first aid and threatened with deportation if they didn’t stop. I always carried my “bust-card”, informing me of my rights as a protester under Danish law. In Denmark preventative arrest is justified to prevent potential public disorder so the police can legally arrest you for simply standing in the wrong place at the wrong time. Each accommodation space organised itself to sort out food, cleaning and recreation. This didn’t always work brilliantly: an agreement to hold a meeting every morning at 9am was undone when no-one got out of bed in time. Often, there were so many briefing meetings happening simultaneously that people would be sent to take notes elsewhere and put it up on a wall in our lobby. By the end of the week there wasn’t a patch of wall left uncovered with minutes and notices. I attended two of the big Climate Justice Action briefing meetings – a good place to find out what people from other spaces were doing and to get dinner: activist kitchens from all over Europe provided hot vegan food on a donation basis. Copenhagen also saw the first mass deployment of the “bike bloc”: mounted affinity groups (friends or like-minded activists looking out for each other) able to mobilise quickly where needed, to distract police and take direct action. Bike bloc training was the most interesting workshop I attended, and the bloc was very effective at Reclaim Power: at crucial moments, many flung their bikes under police vans. These had to be removed manually not to damage the chassis which slowed the police down considerably. Hopefully bike blocs will spread far and wide. Ultimately, we came back exhausted and greeted with little positive news from the Summit, though I doubt anyone really expected any. Johann Hari summed it up when he caustically observed that the most the COP-15 managed was to “note” the scientific consensus about the impact of a global temperature rise of 2c – as well as the fine quality of the Danish catering. But there were other successes – tens of thousands of activists from a broad range of social movements and political groupings from all over the world organising together produced protests, workshops, art and performance, kitchens, housing and everything you could need to make the city friendly a long way from home. Being at Copenhagen has shown me what we can achieve even with our politicians and their machinery set against us. COP-15 has ended in stalemate but the battle for the plan continues. Earlier this week MULE published an exclusive glimpse into the Copenhagen Diary of Manchester Climate Action´s Robbie Gillett and will continue to publish Dispatches over the following weeks. Images taken from ´1000 words and images´ photo blog on a Creative Commons license.